KILLER JOE is a visceral and provocative trash-noir film from director William Friedkin - most famous for THE EXORCIST - but more similar in tone to his more recent tour-de-force examination of mutual psychosis, BUG. Shot in three weeks on a $10m budget, KILLER JOE has a similarly creepy, violent, sexually tense, sleazy atmosphere, and is similarly tightly written - and it comes as no surprise that both movies were based on plays written by Tracy Letts, of Steppenwolf Theater fame. The movie focusses on a messed up southern family - dumb naive father Ansel (Thomas Haden Church); sexually provocative stepmother Sharla (Gina Gershon); failed drug-dealer son Chris (Emile Hirsch) and the apparently mentally disturbed daughter Dottie (Juno Temple). The family live in a trailer, want to bump off Ansel's first wife for the insurance money, and hire Matthew McConaughey's Killer Joe to do the job. Trouble is, he wants more than money - he wants the sexually naive Dottie. The resulting thriller is both a film of double crosses in the standard style, but also a psychological drama about Dottie (Juno Temple) - her violent childhood; her twisted virginity; her seduction; her escape. More widely, it's about Killer Joe bringing the entire family under his control, resulting in the two set piece scenes of sexual power - the aforementioned with Dottie, that's really at the centre of the film - and the second, likely to become the film's notorious calling card, involving Sharla and a piece of fried chicken. It's no surprise to find that these scenes have provoked unease in viewers, and in its final reel, the movie really does just go crazy with the violence. But what I found most disturbing wasn't the movie's violence (particularly toward women) but its humour. Because, make no mistake, this film is funny, particularly in its depiction of caricature tuna-casserole-eating white-trash. The genius of the film is, then, Friedkin's ability, to walk the tight-wire between dark comedy, and genuinely horrific violence, in a way that, say, Werner Herzog's BAD LIEUTENANT: PORT OF CALL NEW ORLEANS, didn't. I also rather like the casting - Juno Temple is particularly impressive as Dottie, but the real genius move is the casting of McConaughey. Friedkin has realised that McConaughey's too perfect, too manicured beauty is slightly unnerving and creepy, and harnessed that for the Killer Joe persona - the knowing, sleazy, seductive bad cop. 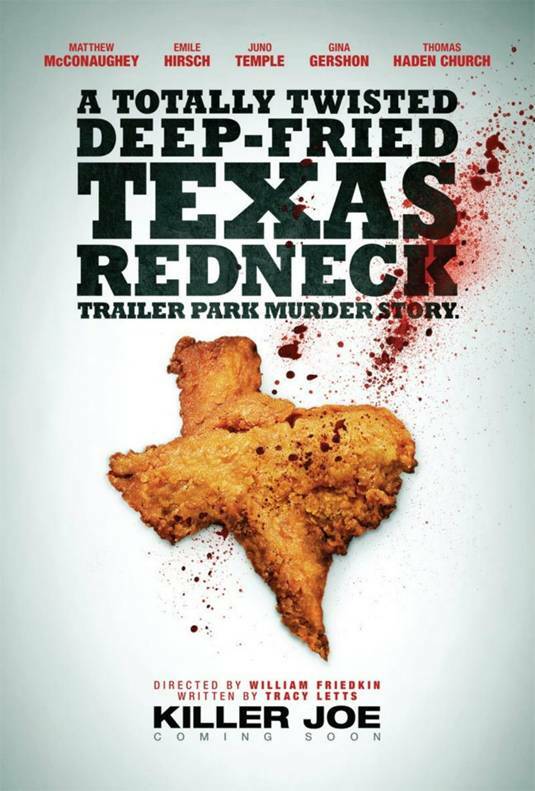 KILLER JOE is on release in the UK. It opens in the USA on July 27th; in Finland on August 10th; in Russia on August 23rd; in France on September 5th; in Belgium on September 26th; and in the Netherlands on November 8th.